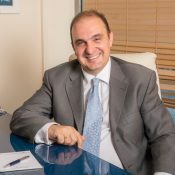 George Moutzouris graduated from the Dentistry School of the University of Athens, where he received the Diploma of Dental Surgeon. 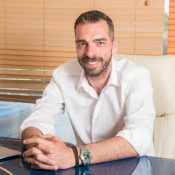 After gaining clinical experience in general dentistry and in particular in Prosthodontics via collaborating with world-renowned experts, he opened his first private dental practice in 2004 in Attiki Iatriki Medical and Dental Centre. He is collaborating with established dental specialists throughout the spectrum of dentistry. His special interest is Prosthodontics. 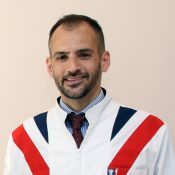 In addition, Dr Moutzouris has graduated from the Postgraduate Health Management Program of the National School of Public Health in Athens and he is an expert in Health Economics. 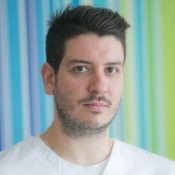 In 2003, in collaboration with a group of medical doctors, he founded the Attiki Iatriki Medical and Dental Centre and he has been an operational manager until today. He was previously the founder and managing director of the Attica Health Care SA, a medical and dental medical company. In 2017, always following the same values and paying attention to the detail, he opened his second dental practice in Neo Psychiko. He provides complete dental services via collaborations with experts in different specialties of dentistry. He is a member of the Greek Prosthetic Society and the Dental Association of Attica. He has numerous publications in International and Greek journals. He had presented his work in many Greek and International dental conferences. George Moutzouris grew up in Neo Psychiko where he lives until today. He is married and has two children. 35 years old. Member of a large family. Blood donor volunteer. Amateur work at the adolescents’ national basketball team infrastructures, volunteer at the Athens 2004 Olympic Games, President of the National University of Athens postgraduate dentistry students. Sept. 1998 – Jun. 2001: High School Diploma. Sept. 2001 – Feb. 2008: D.D.S. Doctor of Dental Surgery University of Athens Greece. Aug. 2004 – Jan. 2008: Dental assistant in private practices in Athens. Aug. 2008 – Aug. 2009: Fulltime General Dentist for the Greek Armed Forces. Sept.2010 – Dec.2010: Training at Leeds Dental School on Pediatric Dentistry. Feb.2008 – present: Associate Dentist in practices in Athens focusing exclusively on Pediatric Dentistry. 1) Dietary habits and bottle use in children with early childhood caries (Research, May 2009, 39th Panhellenic Congress of Pediatric Dentistry, Edessa, Greece). 2) Clinical performance of the preventive resin restorations (Review, May 2007, 37th Panhellenic Congress of Pediatric Dentistry, Kavala, Greece). 3) Caries rate in the occlusal and approximal dental surfaces in permanent teeth (Review, May 2006, 11th student congress of the Dental School of Athens, Greece). 1) Risk factors of malformation of the stomatognathic system during the fetal period (May 2008, 38th Panhellenic Congress of Pediatric Dentistry, Patra, Greece). 2) Advantages and use of the rubber dam in the restoration of endodontically treated teeth – clinical case (May 2006, 11th student congress of the Dental School of Athens, Greece). October 2010 Developing safe and effective practices for anxious patients, Leeds, U.K.
October 2010 Diagnosis and prevention of caries in children – The Scottish Perspective, Leeds, U.K.
Evelyn Betsy was born in Middlesbrough, England and raised in Athens. She graduated from Arsakeion Lyceum in Athens and continued with her academic studies at the Medical School of the University of Athens. She trained in Plastic Surgery exclusively in Switzerland. She acquired further training at the General Pan-Arcadian Hospital of Tripolis and then in 2002 she commenced her specialty in General Surgery at the Surgical Clinic of Elpis General Hospital of Athens, where she remained for two years, while in parallel conducting her doctoral thesis. She then received further education in Plastic Surgery -exclusively in Switzerland- where she remained for 10 years until completing her specialty at the Department of Plastic and Reconstructive Surgery at the University Hospital of Lausanne (CHUV). Her domain of expertise is on Facial Aesthetic Surgery and Breast Aesthetic & Reconstructive Surgery, which she acquired at the Clinic Lemanic in Lausanne and at the Centre de Chirurgie Plastique de Lausanne – Clinic Cecil of the Hirslanden group respectively. She has also served as a Chef de Clinique in Centre Hospitalier Cantonal du Valais (CHCVs) and at the Centre Hospitalier Universitaire Vaudois (CHUV). 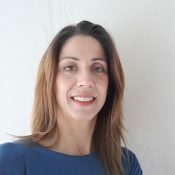 Apart from receiving the FMH title as a Specialist of Plastic, Reconstructive and Aesthetic Surgery in Switzerland, she also gained the EBOPRAS Diploma from the European Board of Plastic Reconstructive and Aesthetic Surgery, thus, she qualified as an Ordinary Member of the “Swiss Society of Plastic, Reconstructive and Aesthetic Surgery”. Evelyn Betsi has a long list of full papers in international peer-review journals, and, has participated at various international and Greek congresses where she presented her independent announcements. She has been married since 2007 and is a mother of two girls. 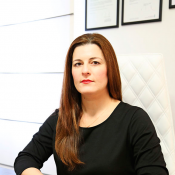 She returned to Greece in 2014 and currently maintains a private practice as a Plastic Surgeon in Athens. Angeliki Papadopoulou graduated from the Military College of Officers in 1999. From 1999 to 2000, she was trained, at the 401 General Military Hospital, in general dentistry and dental surgery. During the period from 2000-2017 she served as a curator and director in military dental and military hospitals in Greece and Cyprus. In 2018 she was assigned and served as a curator at the 401 General Military Hospital of Athens. In February 2018 she completed the postgraduate program of the Dental School of AUTh in the direction of “Dental Surgery – Conservative Aesthetic Restorations”. She has participated as a speaker at Greek and international conferences. She is married and has two daughters. She has been in private practice since 2002.